I use Cacti to monitor a lot of Dell servers, primarily 1850s and 2850s but also the newer models of same (1950s and 2950s). 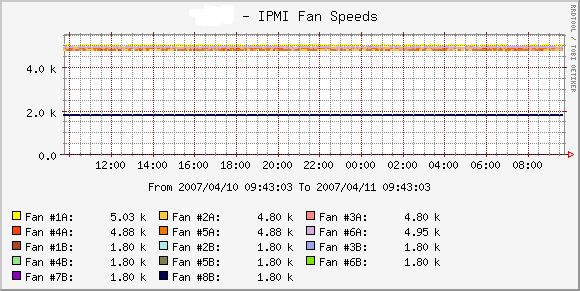 One itch that I’ve meant to scratch for a while is graphing some of the information available through the servers’ IPMI interface; specifically the servers’ various temperatures and and fan speeds. In order to read information from the IPMI, you need the ipmitool utility which is available on most recent Linux distributions or from here. # snmpwalk -c &lt;community&gt; -v &lt;version&gt; &lt;ip/hostname&gt; .1.3.6.1.4.1.X.1000 SNMPv2-SMI::enterprises.X.1000.1.1 = INTEGER: 1 SNMPv2-SMI::enterprises.X.1000.2.1 = STRING: "ipmitemp" SNMPv2-SMI::enterprises.X.1000.3.1 = STRING: "/usr/local/sbin/ipmi-temp-stats" SNMPv2-SMI::enterprises.X.1000.100.1 = INTEGER: 0 SNMPv2-SMI::enterprises.X.1000.101.1 = STRING: "37.000000" SNMPv2-SMI::enterprises.X.1000.101.2 = STRING: "39.000000" SNMPv2-SMI::enterprises.X.1000.101.3 = STRING: "23.000000" SNMPv2-SMI::enterprises.X.1000.101.4 = STRING: "36.000000" ... SNMPv2-SMI::enterprises.X.1000.102.1 = INTEGER: 0 SNMPv2-SMI::enterprises.X.1000.103.1 = ""
Finally, I graph this information on Cacti (see end of post for examples). Cacti host template for Dell 2850. 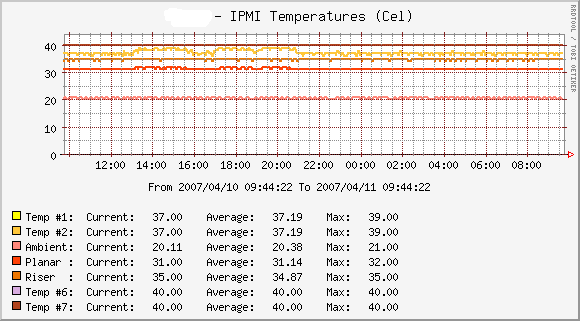 SNMP – Interface Statistics (data query). Example graphs are shown below; they’re not the cleanest given the amount of information they contain but they serve my purposes. © 2007 Barry O’Donovan. All text is licensed under a Creative Commons Attribution 3.0 License. All scripts and Cacti templates are licensed under the MIT License. I tried to create the script and added to snmpd.conf. Did u face it before? You can even hook this up to Nagios to fire off warnings then the temp is out of bounds or if a fan dies with very little extra work. Is there a way to make this work for a 2850 running Windows (using windows snmp.exe)? Superbly useful ! Many thanks. Got this working on Sun hardware and can easily mod for software monitoring, i.e. heartbeat and managed resources. A Windows IPMI-SNMP bridge like this would be a *really* handy thing. Channel 1 is not a LAN channel! I’ve created a device based on the host template but that’s about it 🙂 Anyone that can give me a quick hand? I think cacti is awesome but way too convoluted when it comes to setting it up.. I agree with George above – this is a great tutorial! I am also stuck in a similar place – everything works on SNMP, but not in Cacti. I am using 1950s instead of 1850s, so I don’t know if that creates a problem or not. I was able to get some of the fan speeds graphed, but I cannot get the CPU temps to work. 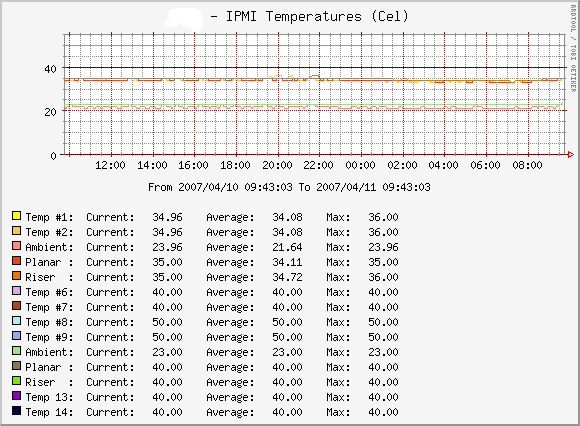 IPMI reports our CPUs by relative temperature, so the numbers are negative. Could this be throwing Cacti off? Also, how does the OID setup work for the data templates? If I want to see a certain value, can I put in the specific OID for that value rather than the generic OID that gets ‘walked’ across? I tried extend; that didn’t help either. On my systems the keyword “exec” changed to “extend” in snmpd.conf. And as the kipmi0 process is cpu hungry i changed my scripts to use an sdr dump file. See the -S option in the ipmitool manpages. Am writing an application that gets the IPMI data over the lan interface. Whatever that you have described here works only with Dell Servers because IPMI data is exposed thru SNMP by Dell Openmanage? I am not sure if the same OIDs work in other server machines. Please confirm. So how do we figure this value for X on the MIB?